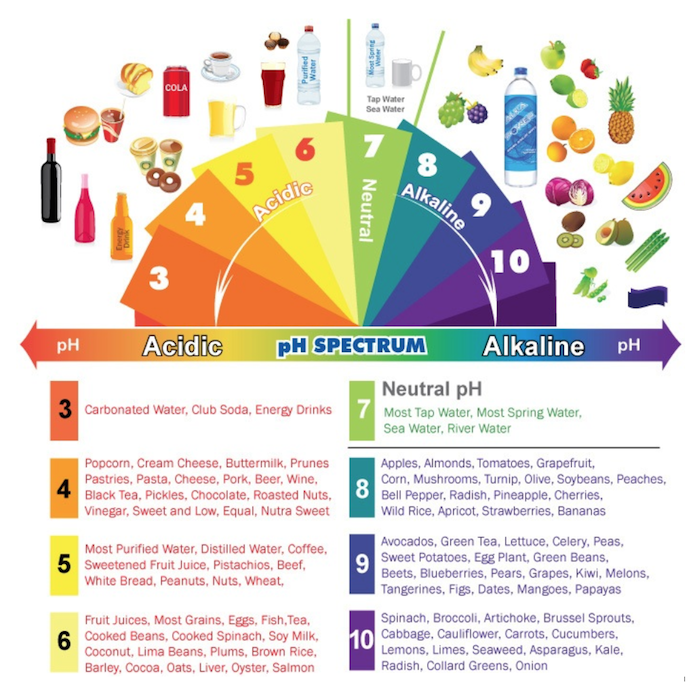 “Body fluids must maintain a very narrow Acid/Alkaline balance. The Acid/Alkaline balance in the body is measured by the pH factor. The pH (potential of hydrogen) ranges from 0, extreme acidic, to 14, extreme alkaline. A pH below 7 is acid and above 7 is alkaline. There is a tenfold difference between each number. For instance, a pH of 5 is 10 times more acidic than a pH of 6. Optimally, we want the fluids in our bodies to have a pH level, which is between 7.35-7.45. If the blood’s pH falls below 7.35 or raises above 7.45 the body cannot function properly. The body spends a tremendous amount of energy and uses the majority of its alkaline mineral reserves to keep the pH at these levels. Injuries repair faster and health challenges in general improve quicker when the pH is maintained in this alkaline zone. At this level of pH, the body is highly oxygenated; it detoxifies and heals itself; its cells are energized; and it has a strong immunity to diseases. Unfortunately, the vast majority of people have an acidic pH level. The key factor to promote healing and improve health is maintaining a balanced Acid/Alkaline state in the body. An acid is a caustic erosive sour substance that has an electropositive charge. The cells cannot dispose of their wastes; therefore, the body’s ability to heal acute or chronic injuries or health challenges in general is impaired. The impairment is characterized by diseased cells, inflammation, excess body fat and suppressed immune function. Acid blocks vitamin absorption and starves your body of essential nutrients, creates toxic buildup in cells, slows down organ function and makes you feel sluggish and weak, prevents proper digestion and creates excess gas and bloating, causes unhealthy weight gain, and speeds the aging process. These conditions are ideal for contracting and breeding various microorganisms, including viruses, bacteria, fungi, yeasts and parasites. Any kind of infection can thrive in an acid body. A lowered immune system results in low resistance to infections, colds, flu, low energy, and allergies. Other common acidic disorders are characterized by tightness, tension and stiffness that can include back, neck, leg and arm pain. Acid accumulation is a direct consequence of our current lifestyle habits. Most of us have acquired a way of living that creates a great deal of stress on our bodies that leads to huge imbalances on all of the systems of the body. Forced to have these stresses and imbalances, the body does what it can to stay in balance and survive. Nearly all of today’s chronic diseases of aging are a by-product of the body doing its best to restore a level of balance. High acidity enters our bodies by eating processed foods, prepackaged foods, sugary foods, white flour products, dairy products, alcoholic beverages, drugs, foods grown and processed with pesticides, preservatives, antibiotics, or hormones. If you are not getting enough sleep or exercise, you probably have more acid than your body can handle. If we are too acidic, we are unhealthy and we will heal much slower if at all. An alkaline substance is one that neutralizes acid. Increasing alkalinity means increasing oxygen. Injuries are more likely to heal faster and more complete when the surrounding tissues and blood are alkaline. Minerals are alkaline because they relax the body from tightness, tension, stiffness and spasms. Due to the alkalinity of minerals, they loosen toxic tissues in the body and cause them to release their toxins. Eating fruits and vegetables is the best way to obtain a large amount and variety of alkaline minerals on a daily basis. Ask us how to test your pH level!